Eagle Wright offers a variety of thermal transfer ribbons to meet your application requirements. We provide ribbon inks from different manufacturers so we have the widest formula selection of Wax, Wax/Resin, and Resin Ribbons to meet the needs of printing your materials. 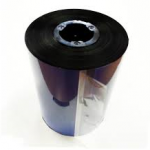 Thermal Transfer Ribbons are available in black as well as a selection of colors. Use the tool bar on the side to narrow your search. please call, 800-875-6411 or Contact Us. Tool to help pick which thermal ribbon should be used. Need to know how many ribbons will be needed to print the job? There are three types of ribbon formulations: wax, wax/resin, and resin. Resin ribbons offer the highest degree of scratch resistance. Resin ribbons are needed where harsh chemicals and extreme temperatures are present. Resin ribbons are designed to adhere to pre-treated polyester, polyimide, polypropylene, and polyethylene labels. Typical applications include appliance labeling, circuit board labeling, and labeling of chemical drums. If you need UL/cUL approved labeling you need to use resin thermal ribbons with an approved label face stock. Any ribbon-width154MM 6.06"4.17"6.06"25mm (.98")30mm (1.18")38mm (1.5")40mm (1.57")55mm (2.17")57mm (2.24")60mm (2.36")64mm (2.52")76mm (2.99")80mm (3.15")83mm (3.27")84mm (3.31")89MM (3.5")90mm (3.54")102mm (4.02")104mm (4.09")106mm (4.17")110mm (4.33")122mm (4.80")130mm (5.12")131mm (5.16")152mm (5.98")165mm (6.50")216mm (8.5")220mm (8.66")1.57"2.24"2.36"2.52"2.99"3.15"3.54"4.02"4.33"5.12"5.98"6.50"8.5"8.66"